One is a solid buy, one appears very cheap, and one is going through a transition. Sometimes, when we try to have our cake and eat it, too, life comes back to bite us. Or, in this case, the market comes back to bite us. 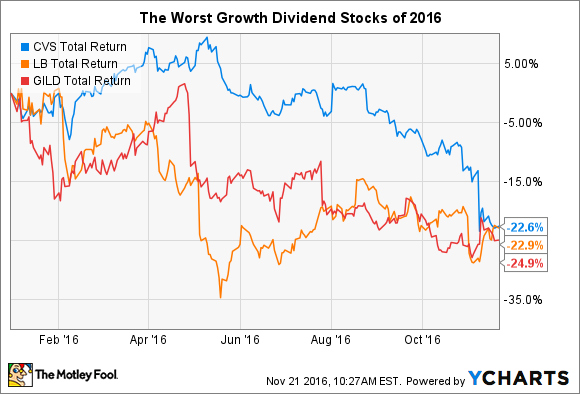 Such was the case this year for investors who bought growth stocks that also offered up dividends. CVS Health (NYSE:CVS), L Brands (NYSE:LB), and Gilead Sciences (NASDAQ:GILD) all have shown EPS growth of over 10% for the past three years -- an impressive run -- and all three offer dividends. But none has had a particularly spectacular 2016, especially considering that the broader market has returned 9% -- including dividends -- over the same time frame. CVS has seen its fortunes dip as of late. The company reported solid results throughout the year, but when it announced third-quarter results, it guided below analyst expectations. The main reason for the less-than-rosy outlook is competition. Walgreens Boots Alliance has managed to grab market share in the prescription-drug category, thanks to winning over several Blue Cross state organizations, as well as one run for active and retired military officers. Currently, you can buy shares for 13 times forward earnings and get a 2.3% yield to boot. That seems like a fair price to me, especially considering the company has produced over $9 billion in free cash flow over the past twelve months. L Brands, on the other hand, experienced most of its losses toward the front end of the year. The company suffered dual disappointments in February, with comps falling 2% unexpectedly, and the unexpected resignation of Sharon Turney, CEO of Victoria's Secret -- a subsidiary of L Brands. The company then announced later in the year that Victoria's Secret would be discontinuing its catalog and the company would effectively be getting out of the swimwear business. While results haven't been terrible, weak guidance has caused the stock to continue its sell-off throughout the year. Currently, shares trade for 19 times forward earnings -- which isn't expensive but also isn't necessarily cheap. The company also offers a 3.5% dividend yield, which appears pretty safe for the moment, as only 60% of free cash flow has been used for regular dividend payments over the past year. Just the bursting of the biopharma bubble? Almost every biopharmaceutical company on the market is down on the year. But that doesn't mean Gilead doesn't have its own company-specific problems it needs to deal with. The company's hepatitis C drugs -- Harvoni and Sovaldi -- were enormous hits for Gildead, accounting for 59%of sales in 2015. But so far this year, competition has caused Gilead to lower prices for the drugs. That means that even though the company's HIV drugs are doing well, and the pipeline remains healthy, the largest part of the company's sales is simply not as strong as it was before. That's caused the company's shares to trade for just six times earnings, all while offering 2.5% dividend. That's an awfully good deal, but it's important for investors to remember that this industry is very hit-or-miss, and powerful moats can be quickly eroded by both competition with similar offerings, and the expiration of patents. If I had to choose one of these three to put my own money behind, it would be CVS. Though recent losses to Walgreens are certainly frustrating for investors, CVS is a cash cow that still has a very strong position in the market -- and probably will for years to come.